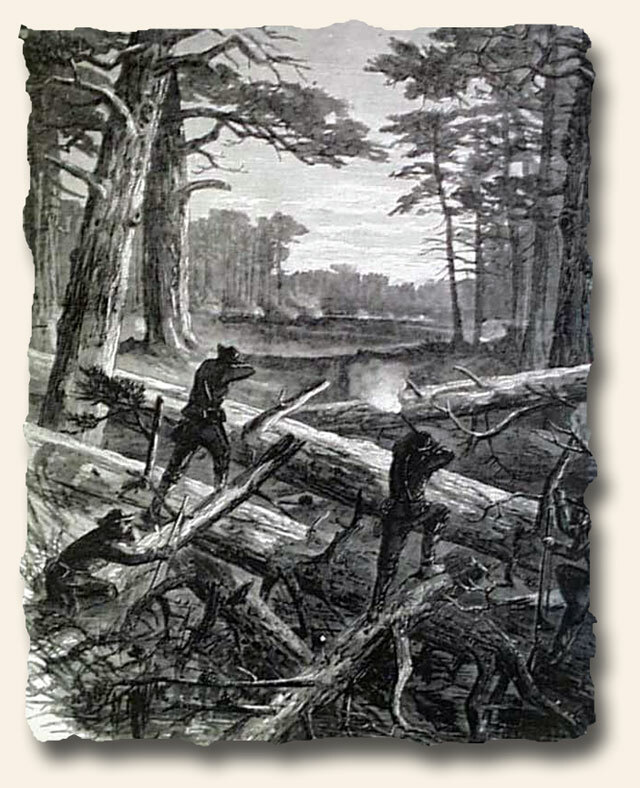 An 1844 issue of the “Adams Sentinel” (Oct. 14th) from Gettysburg, Pennsylvania, has an interesting front page item concerning the fascination of reading old newspapers, noting in part: “…few preserve them…brings up the very age, with all its bustle…marks its genius & its spirit more than the most labored description of the historical…” with more (see). 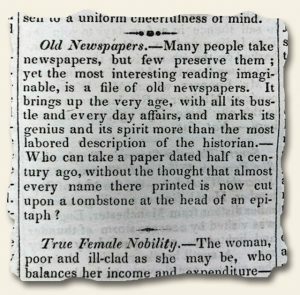 An interesting perspective on the value of collecting old newspapers, written 174 years ago. Television, radio, the internet, texting, Facebook, e-mail… The tools we currently have available for communication are almost endless. 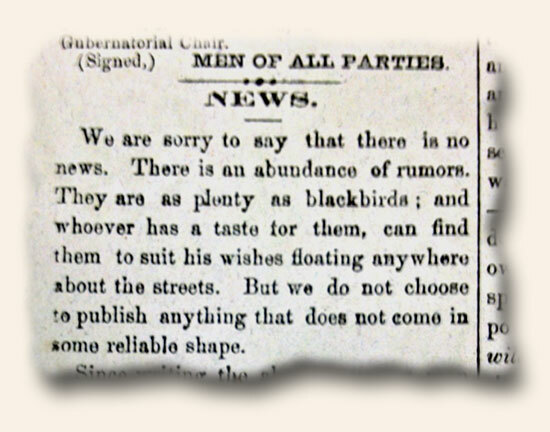 However, there was a time not too long ago when newspapers were the primary means for disseminating information. 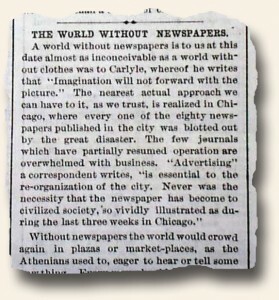 Whereas it would be difficult for us to imagine a world without phones or the internet, the Hartford Courant explores this same concept for those living in the 1870’s through an article in their November 18, 1871 issue: “The World Without Newspapers”. The link above will take you to the entire text of the article. 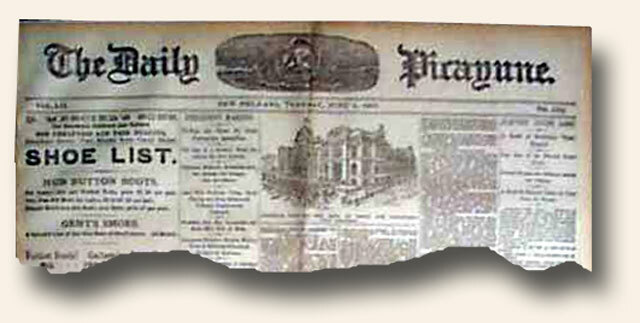 Newspapers have been one of the main means of community communication for several centuries. While many newspaper publishers have closed their doors as on-line access has increased, one would still be hard-pressed to find a city without its own printed newspaper. However, as the number of newspaper publishers gradually decrease, the number of newspaper museums appear to be on the rise. Current news may be best viewed within a moment of its occurrence via the internet, news of the past (history) seems to be best viewed first-hand – either by reading a historic newspaper first-hand, or by visiting one of the hundreds of newspaper and print-shop museums. Collecting rare newspapers satisfies the first, but what about the second? 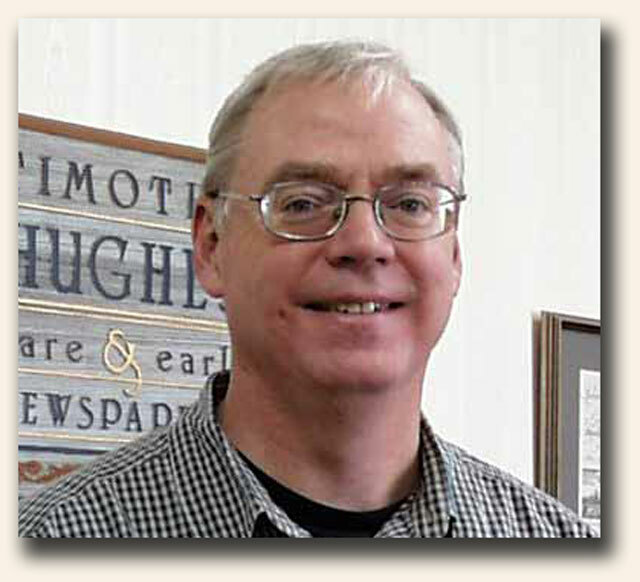 The Newseum and the American Antiquarian Society (think Isaiah Thomas) are great place to start, but what about museums with a more local or historical bent? A favorite for some is the relatively new Edes & Gill Print Shop attached to The Old North Church in Boston, but what about others? If you have visited a newspaper museum and/or historic print shop which you found interesting, please share by commenting with the name, location, and a brief mention of what you enjoyed. Old Newspapers, New Value – How 30,000 antique New Orleans newspapers listed on Craigslist found a new home. At Rare & Early Newspapers we always enjoy hearing about the various “finds” that permeate the collectible. While most significant content is know before one purchases an issue to add to their collection, due to the nature of the hobby, golden nuggets cannot help but be buried, yet undiscovered, deep within the pages of a newspaper. In some instances, the discoveries are quite significant – that is, significant to all having a general knowledge of history. In other cases, the find might be a little more subtle – yet still worthy of bringing to light. The following account was sent to us not too long ago. Feel free to send along your own stories as well (send to guy@rarenewspapers.com). Hi, I just wanted to let you know the papers arrived in great shape as usual but what was really great was once I went through them were the other stories I found. In the inner pages of the Dec. 27, 1941 L.A. Times there was a story about five Iowa brothers joining the Navy and will serve together. This is an article about the Sullivan brothers who were later killed inaction in the Pacific and the Hollywood movie The Fighting Sullivans was made about them. This is why I love collecting newspapers it’s not only about the main story you might have kept the paper for but the inner page stories you might have not paid attention to at first. Thanks C.H. for sharing your story with the Rare & Early Newspapers’ Family. The following account was sent to us a few weeks back. Feel free to send along your own stories as well (send to guy@rarenewspapers.com). newspapers I bought from you folks probably many years ago I found a find. I have started to place my collection into all the same mylar holders and cataloging it into my computer one by one. 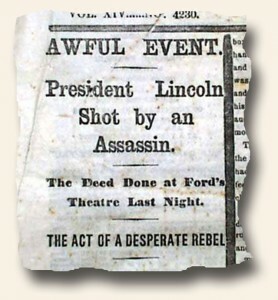 [It was during this time] I came across a New York Tribune from August 12th, 1865 that was included in one of those $199 for 100 newspaper lots I purchased from you. The front page has a couple of interesting articles like the “Annexation” of Canada, which led up to their confederation in 1867. The most interesting was the hours old accounts of the Steamship Pewabic which collided with the Steamship Meteor on Lake Huron. As I recall I think it was either a National Geographic or Discovery channel show. When they discovered the ship that sank in 1865 it was perfectly preserved even the woodwork with the cold non salt waters of the Great Lakes. It would have been better in a Detroit paper, but for $2, I certainly will not complain. I have probably purchased over a thousand newspapers and it took me this long to discover a neat find – maybe not great, but I am pleased. I probably purchased this lot in the mid to late 1990’s. Looking at your website, especially the warehouse photos, there is just too much material to read everything even with a good size staff. Thanks T.C. for sharing your story with the Rare & Early Newspapers’ Family. 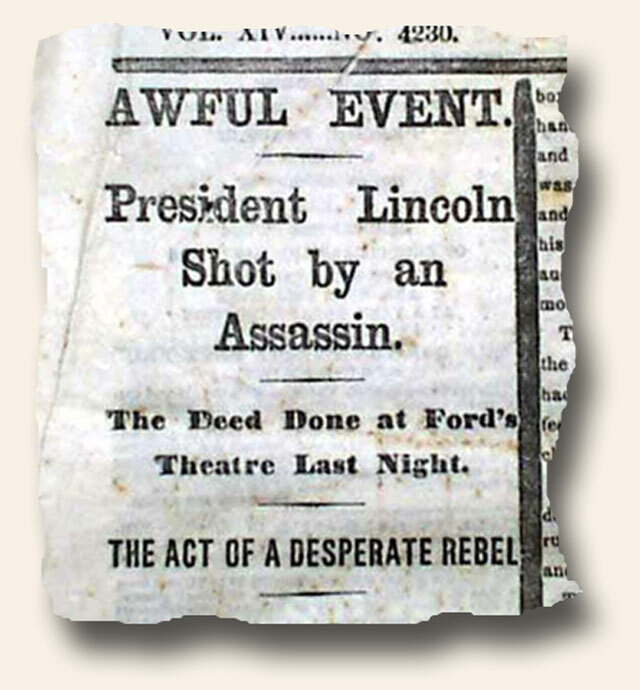 A sampling of what you will find may include articles and info regarding: the assassination of President Abraham Lincoln (along with much on his funeral), the capture and death of John Wilkes Booth, the surrender of Robert E. Lee at Appomattox, the Fall of Richmond, and more. Enjoy! 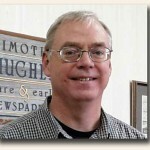 Happy to report that the section “Boston Journalism Firsts” and other contents of the Boston Journalism Trail site were used to nominate Boston for the Historical Site in Journalism Award given by the American Society of Professional Journalists, the largest journalists organization in the United States. The organization gave its 2014 award to Boston, thus for the first time honoring a whole city for the totality of its contributions to journalism. The organization’s president is to present the city’s mayor with a memorial plaque to be placed in a public space in downtown Boston in 2015. Thanks for all your support over the years. 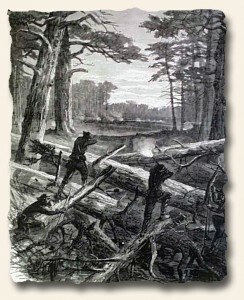 A sampling of what you will find may include articles and info regarding: Robert E. Lee offers pardon to deserters (in a Confederate newspaper), Lincoln’s inauguration and inaugural address, Sherman’s march through the south, southern planters arming their slaves, official battle reports from General Robert E. Lee and General George Meade, and more. Enjoy!